Below are the guides on how to know if MOSFET is defective. 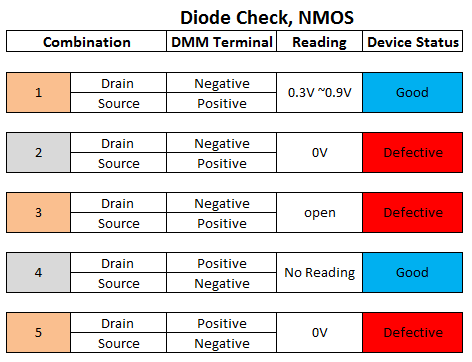 These are the most common techniques that can be used to check if MOSFET is defective. The first thing we will try on how to know if MOSFET is defective is to check the diode drop. Get a DMM and set it to diode mode. For NMOS, follow below setup. For PMOS, follow the setup below. A good MOSFET should have a reading of 0.4V to 0.9V (depends on the MOSFET type). If the reading is zero, the MOSFET is defective. When the reading is “open” or no reading, the MOSFET is also defective. When you reverse the DMM probe connections, the reading should be “open” or no reading for a good MOSFET. If the reading is zero, the MOSFET is defective. 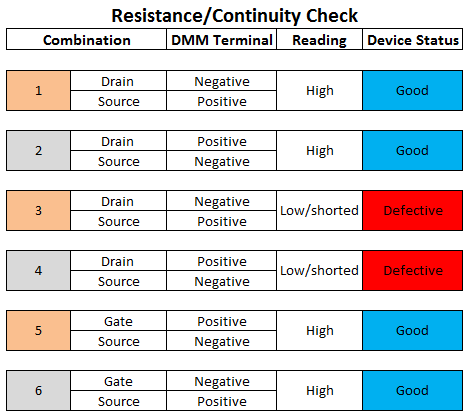 The next method to use on how to know if MOSFET is defective is to conduct a resistance check. 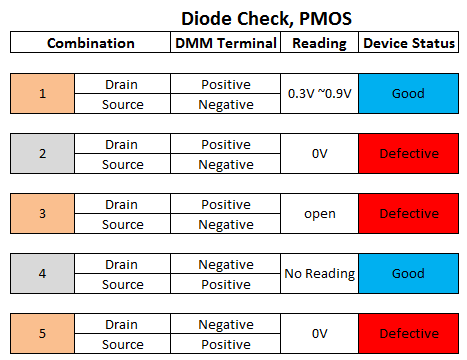 A good MOSFET should have high resistance between drain-source regardless of the DMM probe polarity. 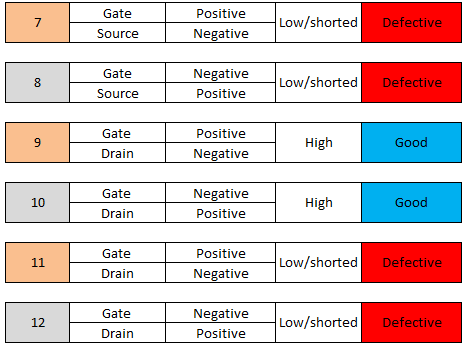 The gate to source has also high resistance in either way for a good MOSFET. 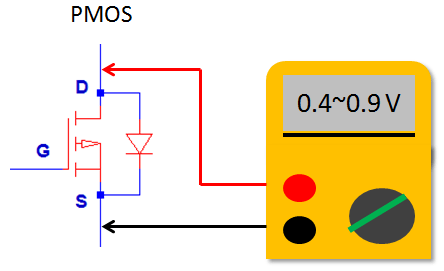 However, you should take note that when you put the positive of the DMM to the gate and the negative to the source of an NMOS, the MOSFET will turn on. You might mistakenly judge that the MOSFET is defective when you measure drain-to source resistance since the DMM will read 0 ohm. The same to PMOS, when you put the positive terminal to the source and the negative terminal of the DMM to the gate, the MOSFET will turn on. If you measure the resistance of the MOSFET terminal to terminal, you should consider the associated resistors for these affect the reading. 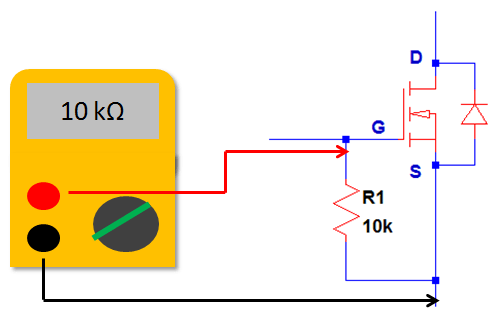 For example in below circuit, when you measure the resistance across gate to source, what you read is not high resistance but the value of R1 which is 10k. Removing the 10k resistor will make the reading high. The third mehotd on how to now if MOSFET is Defective is to do continuity test. Set the DMM to continuity mode. In modern DMM continuity mode usually have audible sound when the measured points are connected. Put the positive to drain and the negative of the DMM to source or vice versa, when the reading is zero or the DMM sound persists, the device is damage; shorted drain-source. Use the same approach to the other leads of the MOSFET and use the same judgement. However, when you put the positive of the DMM to the gate and the negative to the source for NMOS or other way around for PMOS; the device will turn on and when you measure continuity between drain to source; the reading is zero. You might misjudge that the MOSFET is defective. To verify, turn off the device and measure again the continuity. 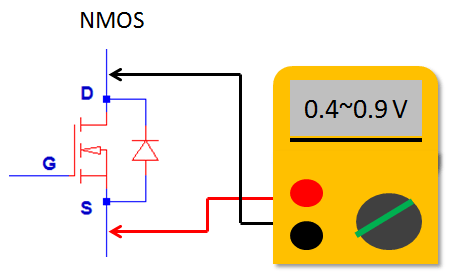 To turn off an NMOS, put the DMM positive terminal to source while the negative terminal to the gate. Do otherwise to turn off a PMOS. A good MOSFET should have no continuity between terminals. If it has, it is defective indeed. Thanks for explanation of mosfet.